REMEMBERING those who gave their lives in the First and Second World Wars, as well as members of the Armed Forces still serving our country, was at the forefront of people’s hearts and minds on Sunday. 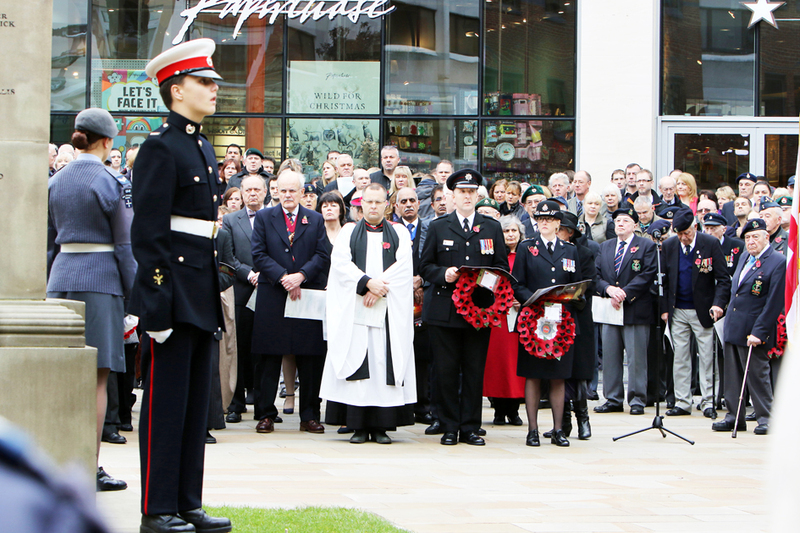 A crimson tide of poppies worn by the hundreds who flocked into Jubilee Square to be part of Woking’s touching Service of Remembrance rippled through the town. Airforce, Army, Navy units and Gurkhas in a resplendent parade. They were closely followed by a Civic Procession featuring Jonathan Lord MP, Woking Mayor Derek McCrum, Council Chief Executive Ray Morgan, Leader John Kingsbury and other councillors. Bisley Ladies Choir gave a vocal performance, with music from the Salvation Army and a moving service led by the Vicar of ChristChurch, Rev Dr Peter Harwood. Readings were given by Dylan McGuinness of Woking Youth Council, Mayor McCrum, Rev Chrissie Lacey, Imam Hashmi of the Shah Jahan Mosque and James Mackay, Churches Together Moderator. Freeman Rod Fraser recited the Exhortation on behalf of the Royal British Legion; Ian Fraser, Chairman of the Woking Royal Naval Association, quoted the Kohima prayer; and Rajen Chhetri from the Nepalese community read the poem Poppies Are Forever. The service concluded with The Last Post, a two-minute silence ending with The Reveille, and laying of the wreaths. Meanwhile, Goldsworth Park saw its biggest ever Remembrance gathering when residents and local groups assembled to pay their respects. The vicar of St Andrew’s Church, Rev Kate Wyles, led members of the Scouts and Guides with their Colours from their base at The Generation Centre to join a congregation of more than 200 at the war memorials in front of the Health Centre. Wreaths were laid by members of the Goldsworth Park community and relatives of those named on the plaques. Martin Slocock of Slocock Nurseries, on whose land Goldsworth Park was built, laid a tribute in memory of nursery workers who died in military service. Over in Surrey Heath, Mayor Joanne Potter paid homage at St John the Baptist Church in Windlesham and St Michael’s Church in Camberley, while her deputy, John Winterton, attended All Saints in Lightwater and Chobham St Lawrence.